It helps women solve one of the most gut-wrenching relationship situations: getting broken up with. The Relationship Rewrite Method presents a revolutionary approach to fixing relationships, because it works across the full spectrum of troubles, from the man who goes cold after a bad fight, all the way to the full-scale, catastrophic breakup. The Relationship Rewrite Method helps women rewrite past mistakes in their relationship and forge new, deeper bonds of love. It provides the missing training that can mend the wounds of the heart. One of the most powerful parts about this method is that it works even if her man is currently ignoring her calls and texts! But we’ll speak more on this later. We’ve tested this program and women love the Relationship Rewrite Method! The course is flying off our digital shelves, and it’s helping save relationships everywhere. And in the process of doing so much good, this offer is on track to earn our affiliates millions of dollars! Just look at what one affiliate had to say about his recent test promotion. "... These epc’s are ridiculous. I just looked over the stats and the epc’s were around $3.37! I’m going to promote again in a few weeks because I obviously need to get more women to your VSL! Congrats, it looks like you’ve got ANOTHER winner!!!!" We’re paying out a MINIMUM of 75% on every product in the funnel; this is on the front-end and the back-end. And after you’ve gotten just 5 simple sales, just let us know and we’ll bump you up to 90% front-end and upsell commissions. And these 5 easy sales can be from any of our previous courses during any time-period. It’s easy to get 90%! We want to give it to you. We want to give you every edge we can, so you can be profitable! Because when you win, we win too! Our funnel has been carefully tested and optimized. We’ve honed this offer into a conversion machine because we know how hard it is to generate traffic… especially traffic that converts. 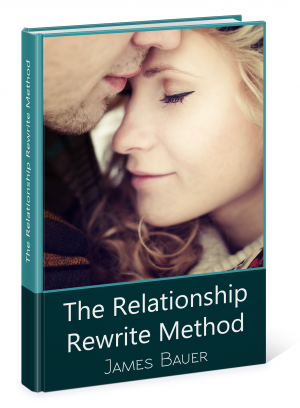 The Relationship Rewrite Method is a breakthrough program written by relationship expert James Bauer, and it’s based on over 12 years’ worth of research, consulting, and experience. The Relationship Rewrite Method teaches women to use secret emotional triggers to reclaim a man’s interest and prevent him from growing distant or pulling away. It's these emotional triggers that can bridge the gap with even distant men. Plus with James’ “foot in the door” technique, women can bring him back, even if he isn’t talking anymore. And by using special embedded compliments and metacommunication techniques, women can touch on deep emotions and open up their relationships to love again. Powerful hooks and angles for crafting your own pitches. These are built to enhance whatever traffic source you’re using, to help you set yourself apart from the competition. Please feel free to contact us with any questions or special requests. We’re looking forward to making this your best promotion to date! Now go ahead and click below to get started. Results may vary. No guarantee of success with this affiliate program is implied. All commissions are paid from sales of Clickbank products, commissions are paid by Clickbank. In order to qualify for the 90% commissions you must have 5 sales with us (from any time period), and request the 90%. This is because we have to manually raise your commissions from the default max of 75% for the front end product and the upsell products. You can learn more about how Clickbank pays their affiliates here. Sign up below to get your FREE access. Discover powerful traffic generation and promotion techniques! Gain access to high converting banners, emails, PDFs, and more! Let us kickstart your success in the relationship marketing niche! We respect and guard your privacy. We will not send you any junk mail. Yes, you can go straight to the tools area by clicking below, but be warned. Our training emails are based on millions in adspend and split testing. You do not want to miss this content. Reading a few emails from beirresistible will save you thousands of dollars of wasted testing and experiments. We know what works in the relationship niche! Take me to the tools area.